Everyone is a beginner at some point. If you’re just starting out or have never wakeboarder before, Jibtopia Wake Park is the best place to learn to wakeboard. The beginner cable, Cable 3 is by far the easiest way to learn to get up on a wakeboard. The rider can either sit on the floating dock at the edge of the water, or in the water and is gently pulled up on top of the water by a handle and rope that is attached to the cable 30’ overhead. Because the attachment point of the rope to the cable is 30′ above the rider as opposed to the attachment point being 2-7’ above the water, as it is on a boat, the rider is pulled up on top of the water instead of being pulled thru the water. This makes it much easier for beginners to get up on their first try. The cable is controlled by a remote control that has a variable speed which can be dialed down to the slowest possible speed to get each individual rider on top of the water. As the rider improves their skill and confidence, the speed can be very gradually increased so that the rider doesn’t notice the change but rides more cleanly and comfortably. We have successfully taught 7-year-old children, 72-year-old men, and every age in between how to wakeboard. 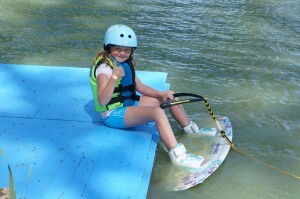 We can teach almost anyone to get up on a wakeboard and have fun! First of all, what is a feature? A feature is an element that is placed on the course to enhance the experience and allow the rider to become more proficient. Features can include ramps, rails, pipes or other elements. Our features are designed in easy incremental steps that make progress seem really easy and fun. A brand new rider can progress from sliding the easiest beginner rail to the next level without any hard falls. Each time a rider successfully slides a new feature there is another feature which is just slightly more challenging than the one before and our trained coaches can help you take each step. By gradually improving we have helped many novice rail riders to be able to slide challenging rails after just a few visits to Jibtopia Wake Park because of our easy 3 part learning system. The first part of our 3 part learning system is easy incremental rails. The second part is our variable speed remote that the driver can use to adjust the speed to any riders ability. The third is having trained coaches that are watching each rider individually slide each feature and are available to give pointers and suggestions for improvement.When you come to Jibtopia Wake Park with the desire to learn and improve you will make progress every single day. We love to see the sense of pride that comes from our friends and customers accomplishing new challenges that seemed out of reach weeks, days, or even hours ago.